DUBLIN, Dec. 5, 2017 /PRNewswire/ -- Today, Endura Technologies (International) Ltd, announced the ET7700 product family, the industry's first 28nm embedded voltage regulator (eVR™). The Endura ET7730 is a 3-phase 6A switching regulator. It is integrated inside the SoC package within 5mm2 area and less than 200um height including inductors. The ET7730 product delivers exceptional performance in a very small form factor module with integrated passives and outstanding cost and BOM savings. The ET7700 product family will include a fully integrated stand-alone module in 2018. "This milestone is an important achievement and the culmination of several years of intense design, development and concept validation enablement effort with various partners," said Taner Dosluoglu, CEO, Endura Technologies. "We have designed the most advanced embedded switching voltage regulator that delivers high performance while using very small inductors (<6nH) and capacitors (<0.47uF) providing high efficiency, small form factor (<1mm3), PCB area and BOM savings, as well as support for high-definition DVFS." Evaluation boards are available for testing and validation. Endura Technologies is a fully funded enterprise and is a portfolio company of the Bridgewest Group. The Bridgewest Group is a closely held investment company with global assets in the biotech, wireless communications, infrastructure for "internet of things," semiconductor, commercial and residential real estate, asset management and financial services industries. In business for over 25 years, with operations around the globe, the Bridgewest Group creates long-term value through the application of superior industry knowledge, operational expertise and significant financial resources to attractive investment opportunities. 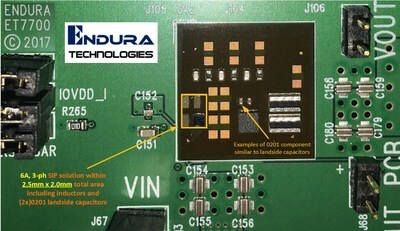 SOURCE Endura Technologies (International) Ltd.